The apricot season, a brief window for making an apricot tart, is quite short, even here in Southern California. I like to jump on these guys when they look and smell good. 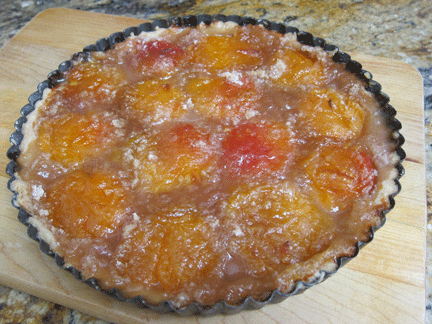 I found some organic apricots this morning at Trader Joe’s and dug out my tart recipe. This Apricot Tart is a very flexible recipe for any kind of fruit tart and can be made with apples, blueberries, etc. The only special equipment you will need is a tart pan with a removable bottom. Be sure to place the tart on a sheet pan to catch the juices when they spill over – and they will! Sift together the flour, salt and sugar. Add the butter and vinegar; mix with two forks or clean fingers and press into tart pan. If the dough is too sticky to press out, add a little flour to the dough and your hands. 1. Mix together the sugar, flour, cinnamon and Amaretto, then coat the apricots with the filling and arrange face down on the crust. 2. Sprinkle rest of filling over the fruit. Brush the tops of the apricots with the warmed marmalade. Place tart on a cookie sheet to protect your oven from spillage. 3. Bake for one hour. Cool before removing tart pan side and serving. Wow Liz, this looks really nice. I have peaches and plums in my fridge tonight–I’m thinking it might be nice to do this with a mixture of both and 1/4 of my very own Tangerine Ginger Rum Jam instead of Marmalade…. :) You are an inspiration! Great idea – I’ll bet the combo will be delicious!